As I wrote back in December, there are plenty of things to do during the winter in Orange County NY. In my never-ending quest to learn more, and because I love both food and cooking, I signed up to try three cooking classes. Following is my overview of my first attempt. I showed up at the Orange-Ulster Boces adult and continuing education location a few minutes before the program started at 6. The kitchen wasn’t quite ready as the chef was prepping, so I stood near the entrance watching as people came in for other classes. There were a bunch of folks with guitars and many who stopped at security to sign in to notary classes. A steady stream of people who are curious about new things, or want to improve their skills came in. If you have been considering attending a night class of some sort, but are holding off signing up because you don’t want to go alone, have no fear! You’d be in great company! Many adults were at the center last night to learn something new. But back to the cooking class. Right around 6pm, I was ushered into the huge kitchen area. This kitchen was stocked. Tons of sharp knives hung in their place. There were multiples of everything – colanders, pots, pans, mixing bowls of every size, six or more stoves, broilers, four huge sinks, and on and on. I was in kitchen heaven. As soon as I walked in, I was told to grab a knife and start chopping onions. So I did, and when everyone was there (we had a class of 6), the chef told us what we would be making and started directing us to get to work on different parts of the menu. 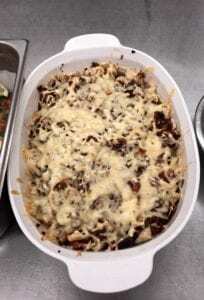 This particular class was focused on German cuisine. Here’s what was on the menu: Schwabische Kasespatzle which was basically a macaroni and cheese dish, with german spatzle, butter, onions, and different types of cheese. We had to make the spatzle first; this is a noodle which includes flour, salt, nutmeg, eggs and milk. 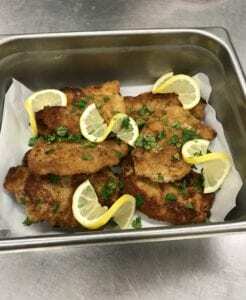 Also, we made jagerschnitzel which was basically breaded and fried thin pork chops. To go along with the pork, we made brown mushroom gravy which had 13 ingredients! And finally, a warm apple and cabbage slaw. The trick to making a meal like this was to do everything in the right order. The onions and mushrooms were sliced first, and then the ingredients for the spatzle were put together and the food processor/mixer was started. Then we worked on carmelizing onions for the kasespatzle. The cooking of the gravy was next, then the mixing of slaw ingredients, cooking of spatzle, putting together of the spatzle and cheese dish and getting that into the oven, and heating up the sauce for the slaw. Somehow, everything was cooked by 8pm, and we got to taste the result of our efforts. As you can tell by the photos, everything looked and tasted great! That being said, I personally would not make most of these dishes again. That’s just because I’m not a fan of macaroni and cheese type meals (too heavy for me). I’d make the pork again, but the recipe wasn’t much different from the way I’d do it anyway. 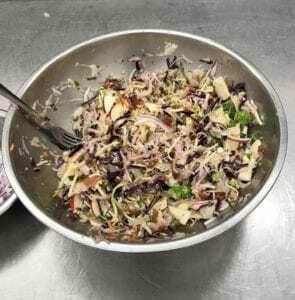 As for the apple and cabbage slaw, I thought this would be my favorite part of the meal but the combination of ingredients didn’t quite work for me. Trying it though did make me want to look around for another recipe that might be tastier to me. Bottom line is that I had a great time. I met some new people, got tips from the chef in terms of what to do when making roux and frying foods, tried some new recipes, and took away some tips on what to bring next time. So for anyone who might be thinking of going to a similar class: bring your own water or seltzer to drink with dinner, and bring a plastic container to take home left overs. Oh, and some music related to the cuisine would have been fun to play in the background while eating. I tried to get “german music” on my phone but the cell service wasn’t working well, so I gave up. Next time I’ll be prepared. It’s not too late to sign up for other classes being held this winter! There are many options still to come before the season ends and this really was a fun way to spend a few hours on a winter evening.